Make the choux pastry: preheat the oven to 220°C/gas mark 7. Oil 2 non-stick baking trays. Sift the flour and set aside. Measure 140ml water into a small pan and add the butter. Bring to a boil and, as soon as the butter has melted, tip in the flour. Beat with a wooden spoon for a minute then remove from the heat and beat for 5 minutes more. Stop when the mix comes away from the pan cleanly. Beating all the time, incorporate the eggs into the dough a little at a time. Use an electric whisk if you can. Ensure each bit of egg is absorbed before adding the next. Stop when the dough is smooth and glossy but stiff enough to hold its shape. Spoon the mixture into a piping bag with a 1.5cm plain nozzle. Pipe 8cm-lengths of pastry on to the baking sheets, making sure there is plenty of space between each. If you have problems piping, create little pastry rolls using a teaspoon. Bake for 20 minutes or until dry and crisp. Transfer to a rack and puncture the side of each eclair with a small hole to allow steam to escape. Make the praline. Lightly oil a baking sheet. Put the nuts and sugar in a large heavy pan. Set over a low heat and stir occasionally until the sugar has melted and is beginning to caramelise. Continue to cook until the nuts are well-coated and the melted sugar is a deep golden brown. Pour on to the oiled sheet and leave until cold. Break up, put in a food processor and whiz to a powder. To make the crème pâtissière for the filling, place the egg yolks and a third of the sugar in a bowl. Whisk until it's pale and forms a light ribbon. Sift in the flour and mix. Put the milk, remaining sugar and the vanilla pod in a small saucepan and bring to the boil. As soon as it bubbles, slowly pour into the egg mixture, stirring all the time, then return to the pan and cook over a low heat - still stirring. It will begin to boil. Continue to cook and stir for 2 minutes then scrape into a bowl and cover with greaseproof paper. When cold, measure out half the crème pâtissière. Whisk in 55g of the praline powder, then fold in the whipped cream. Split each eclair and fill with the praline cream. To make the icing, mix the cocoa powder, sugar and water in a pan. Set over a low heat, stir until the sugar has dissolved, then bring up to the boil and remove from the heat before stirring in the icing sugar. Once smooth, dip the eclairs in. Set aside until the icing is firm, then serve. 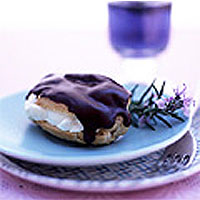 Alternatively, the completed eclairs can be frozen.